The first pair of running leggings that I’ve ever made and I’m feeling pretty proud of them! They’re made from Papercut Ooh-La Leggings pattern, which is a fashion leggings pattern, not a sportswear pattern. 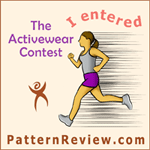 I first saw this pattern used as running leggings on KBenko’s blog back in August 2012. This seemed like a wonderful idea, so I bought the pattern. And let it sit in the cupboard to age sufficiently until I got up the nerve to make them…. The reason I was so hesitant to make them up is that there is so little sizing information in the pattern package. There is a list of sizes with measurements for bust, waist, hips, but that’s it. No finished measurements, no list of required fabric other than “merino knit”. Having had a lot of fitting disasters issues in the past, I was hesitant to have another one. However since it’s coming into winter, and I badly needed another pair of full length leggings (I have one expensive pair of Lorna Jane compression leggings already) I realised that buying another pair wasn’t actually on the cards. Not when I had both pattern and fabric here. So this past friday I bit the bullet and made a pair. The pattern is quite nice, packaged beautifully and printed on brown paper. All the sizes are there, without overlapping lines so very easy to trace. The instructions say to cut out the appropriate size, but I traced it onto vilene. Partly because I prefer not to cut patterns, particularly if I’m unsure of the sizing and may want another size, and partly because there’s two of us here who wear leggings and I’ll definitely need more than one size for both of us. I chose my size off just my hip measurement of 103cm. The hip size for S is 100cm, and 106cm for size M. Since I’m working with stretchy fabric I went with the smaller size. Dark printing on brown paper, while it looks good, is awkward to trace. It’s hard to see the dark lines on the dark paper so tracing took longer than usual. There were also more pattern pieces than I’m used to for leggings, with three pieces per leg and a front and back (five pattern pieces in total). I was ecstatic to discover that I can get a pair of full length leggings out of a single metre of fabric! The first pair, to check sizing, was in an ugly green t-shirt fabric that I dragged out of stash. Surprisingly, they fitted first go. A couple of other people have mentioned that the legs are quite long and I have to agree. I took 10cm (4″) off the bottom of the leg to make them ankle length. You can see in the below photo (a) how ugly the fabric is and (b) one leg trimmed and one still all scrunched up. The fabric I used for my good leggings is a darkish blue Supplex, bought from Addicted to Fabric. It’s the only supplex I’ve ever seen there, except for one other that was labelled supplex but was in fact lycra. This supplex is nice and thick, with almost a loopy back on it. I read somewhere that supplex is wind resistant, and I have to say I was very skeptical. Warm yes, but wind resistant is asking a lot from a fabric. To smarten up the leggings I embroidered the top of one of the leg inserts with an ink style tiger. And here’s where I made one of the stupidest sewing mistakes ever. In order to embroider on knit fabric (or any for that matter) you have to stabilise the fabric. When working with knits, I often use wash away stabiliser, which I did for these. I embroidered the leg piece before construction, and to ensure that it wasn’t stretched while putting it in the embroidery frame, I used temporary adhesive on the wash-away, and adhered the fabric to it. The embroidery, in a soft gold metallic thread, went beautifully. Then I went to put the leg piece onto the main body. The order of construction for these leggings has you sew the front and back together at the side seams, then the outside leg pieces, one of which was now embroidered, then the rest of the legs, finishing by stitching the inside leg seams. So I had done the side seams, stitched in the plain leg piece and went to sew in the embroidered piece. Did I mention I’d used temporary adhesive to glue the fabric to the stabiliser? Then removed it from the hoop and cut away the excess stabiliser? Sounds pretty normal so far…. right up until I went to sew the seam. I sat at my overlocker, looked at the fabric and thought “This is still a bit sticky, I wonder if it will catch as it feeds through?” AND THEN I FED IT THROUGH THE OVERLOCKER. Well, I tried to. It did stick on the feed dogs, and the fabric twisted and the overlocker blade cut a hunk out of both the leg piece and the main body piece. I said some very bad words. How stupid is it to think about a problem, and then go and do it anyway? Luckily I had more fabric, and was able to cut out another pair. This time I thought about it a lot more, and did the embroidery with the leggings almost fully constructed, just without the inside leg seams done. So it didn’t matter about excess adhesive as there were not seams to be done in the area. I did the second embroidery in a rayon embroidery thread, as I realised the metallic thread would chafe during a run. If I were doing this again I’d put the tiger on the other leg, or flip the embroidery, so it’s more towards the front. But it looks good and smartens up a plain pair of leggings. I’m not sure how durable this embroidery is going to be when washed constantly, after completing it I realised that a permanent layer of stabiliser might have been a good idea. Too late now, only time will tell. All the seams are first overlocked then topstitched so they lie flat, using a stretch stitch that looks like a straight stitch. It took quite a while to sew them up, they’re definitely nowhere near as fast as sewing a pair of normal leggings. The ankles are hemmed using three step zig zag, again so it lies flat and stretches. The waist I did using the Better Elastic Waistband tutorial from Fehr Trade. I’ve used this waistband method on a couple of garments and it’s simple and very effective, plus non-irritating against your skin. I wore these for three runs on Saturday, a total of 12.7km and they were great. They felt good, I love that they are waist height as I usually spend a lot of time pulling up my medium rise leggings which feel as if they’re constantly falling down. Even better, this supplex really IS wind resistant. 🙂 Saturday was a cold, windy day and my legs were lovely and cosy. Couldn’t say the same for my top half! I will definitely be making more of these. I have enough blue supplex left to make another two pairs (I think, hadn’t counted on having to recut these ones) and also lycra that would make some bright fun leggings. More of these will be great for running in those sub-freezing winter mornings that are coming very soon. My next running sewing endeavour will be a running skirt. I’ve had the Jalie running skirt pattern here for about a year, even longer than the leggings pattern, and haven’t even opened the package. I had no idea it was possible to make running leggings! Another reason why I need to learn to sew/use a sewing machine!